Mountain bike tires come in a range of sizes, but narrowing down your selection to a specific width comes down to your riding preferences and the terrain you expect to face. Mountain bike tire width is measured in inches, and two common widths are 2.1 inches and 1.95 inches. Going narrower can give you a boost to your speed, but a wider tire can improve your grip and reduce your chance of a flat. 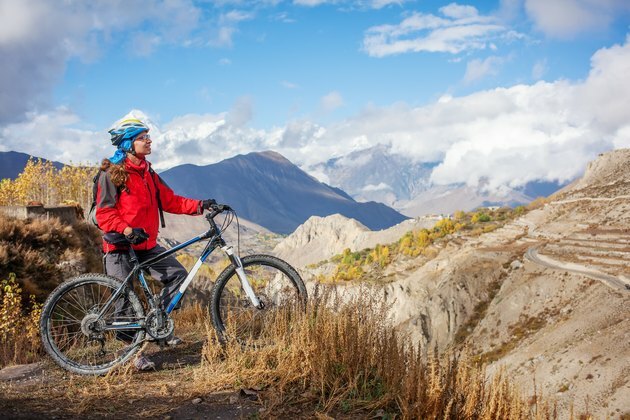 For mountain bikes, tires are measured in inches, and the standard wheel sizes are internationally recognized. A mountain bike tire's diameter can be 26, 28 or 29 inches. Downhill mountain bikes and trial bikes use a 26-inch wheel, while cross-country bikes tend to prefer a 29-inch wheel. 28-inch wheels are a less common alternative to a 29-inch wheel, preferred by shorter riders. Tire widths generally fall between 1.5 inches and 3.0 inches, but the most common tires are usually close to 2 inches in width. The width of your tire affects speed and traction through an increase or decrease in the size of the contact patch. The contact patch is the part of the tire that touches the ground at any given time, and it's usually only 1 or 2 inches long and wide. A wider tire like a 2.1 inch will have a slightly larger contact patch than a 1.95-inch tire for two reasons; first, the 2.1-inch tire is wider, exposing more of the tread to the ground. Second, the 2.1-inch tire has more volume, which lets it run at lower tire pressures without risking a flat. A lower tire pressure increases the size of the contact patch, giving the bike a better grip. A bike's speed is limited by several factors, one of which is the rolling resistance of the wheels. A larger contact patch gives you better traction and absorption, but you'll sacrifice some speed to the friction from more of the tire contacting the ground. A narrower tire like a 1.95 inch will have decreased rolling resistance, giving you greater speed on hard-packed trails and pavement. A higher tire pressure makes for a rougher ride, but the bike will feel quicker and accelerate faster. Getting a flat can put a serious damper on your day. The tire size you select can have an impact on your chances of getting a flat. Generally speaking, a narrower tire is less flat-prone than a wider tire because it runs at higher tire pressures, which reduces your chance of getting a pinch flat from the tube pressing against the sides of the rim. However, the width difference between a 2.1-inch and 1.95-inch tire isn't significant, so your chance of a flat may be much more dependent on where you ride and how regularly you top off the air in your tires.